This fall, for the first time, I started using liquid inks. They are runny and act just like real inks straight out of the bottle. I had explored the liquid inks that come with Painter, and had been under-impressed. However, I found some fabulous liquid ink brushes over at Skip Allen’s blog. A great thing about Skip Allen’s blog is that he gives away his Painter brushes for free. Please note, you should donate if you nab a lot of his brushes. You can get to Skip’s blog by clicking here. Skip has two categories of liquid ink brushes. A sort of basic set called Inkspiration and another, very interesting category called Skip’s Liquid Ink. I did a few dream catchers with Skip’s liquid inks, and loved them. Liquid inks work on their own layer. The liquid ink layer has its own properties which can make them a bit overwhelming to work with. However, I used liquid ink brushes without knowing about the layer attributes, as they are called, and they worked just fine. I decided to try some in this abstract. I laid them down using three or four colors close to each other on the color wheel so I got a nice gradient. I changed some of the brush settings and added jitter to the brush to make the colors blend together better. I dropped the liquid ink layers down to the canvas and then just incorporated them into my painting. I don’t know if you can see in this abstract, but they do give the painting some texture. I got a little over-anxious and kind of over worked the liquid inks with the paint. I also used some new pencils that I made during a recent class at the DAA (Digital Art Academy). 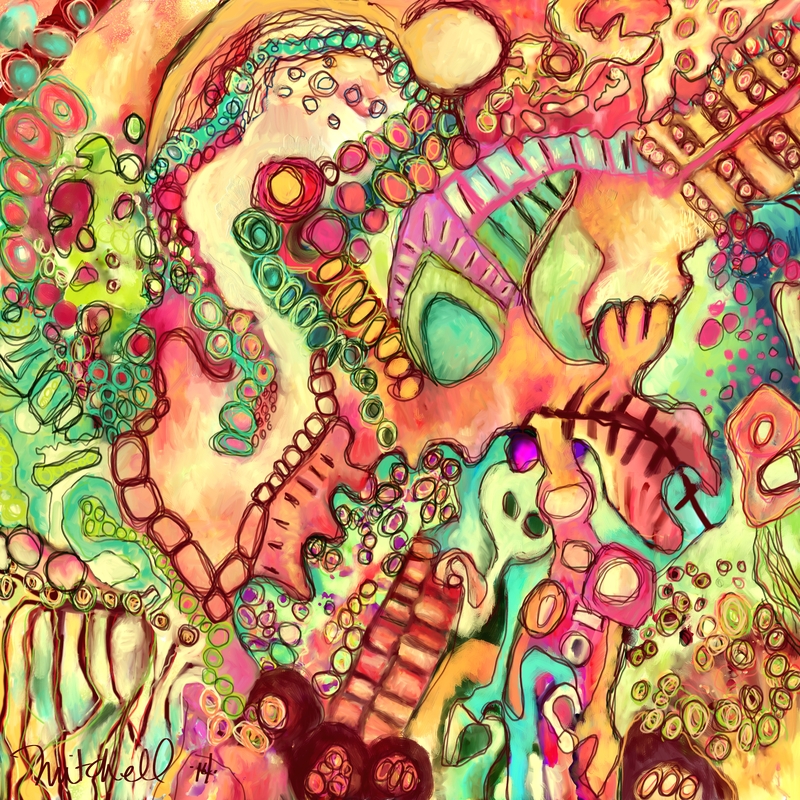 I really liked adding the pencils into my abstracts. It adds a new dimension to my paintings. I’m continuing to use them in my abstracts. As usual, I had a lot of fun working on this abstract. However, after I posted this painting at Facebook, someone said she could see ET in it. Ugh. Now, I see him too. I’m thinking I need to go back and rework that area. Is this the one that you turned upside down and reworked? Hi Carole, It will be up next. Thanks for stopping by. I love your work with the bright colors but I do like the depth and detail in this new one. I saw ET right away! But then I looked closer and didn’t think it looked like an alien as much as I first thought. It’s interesting to learn about all the digital media art tools out there and your experiences with them! Thanks for the comments, Trisha.